The Royal Cancun, All Suites Resort sits on a sheltered beach within a short distance of Playa Langosta, Playa Linda, Playa Tortugas and the observation deck, “Torre Escénica”. The Hotel Zone’s major shopping malls, nightclubs and golf courses are only a 10-minute drive away, as well as Downtown Cancun and Cancun International Airport is 25 minutes away. Take advantage of all the resort amenities The Royal Cancun has to offer, including two free-form pools, tennis courts, gym, beach massage service, a mini market, bicycles, sailboats, travel agency, car rental and an activities program for children and adults. 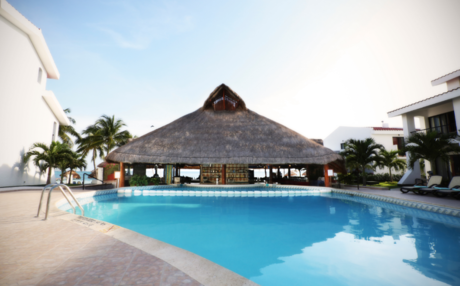 Great dining options for every taste: La Palapa beachfront restaurant, The Italian Trattoria, The Italian Trattoria Sports Bar, pool bars, express take-out food counter pizza delivery and room service. A complimentary guest shuttle bus also puts the activities and entertainment available at the other Cancun Royal Resorts within your grasp. Enjoy fine dining, activities and many other amenities with the All-Inclusive package or the European Plan. La Palapa Restaurant: Located between the main pool and the beach, La Palapa Restaurant offers incredible views of the colorful bay and Isla Mujeres. 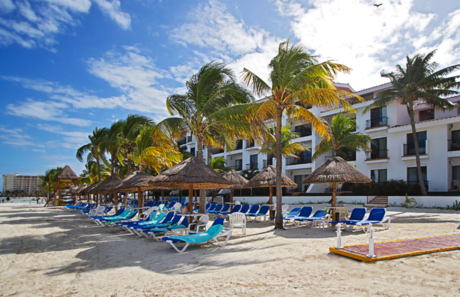 Enjoy the tropical environment and a menu of fresh seafood, Mexican and International dishes. La Palapa is a longtime favorite with guests who love the laid-back ambiance, the home-style recipes and the friendly staff. There are theme nights and buffets on different nights during the week. The Trattoria: Perfect for dinner, Traditional Italian dishes such as carpaccios, salads, pastas, pizzas, saltimbocca and much more. 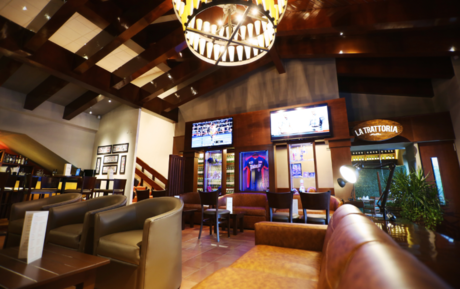 The Trattoria Sport Bar: Even if you’re on vacation, you won’t want to miss the game! One 80” plasma TV and two 60” plasma TVs will make your experience great! Pool Bars: Take advantage of our two pool bars serving a wide variety of Caribbean cocktails, frozen drinks & beers. Royal Express: Tasty and convenient food-to-go counter offering salads, roast chicken, ribs, meat loaf and other main courses, bread and desserts for casual villa dining. Bartolo’s Pizza: Whether it’s plain cheese or pepperoni, just order your pizza from the resort and it will be delivered to your villa! Rate Plans Available: Choose between the All Inclusive and the European Plan. European Plan (Room Only – No Meals Included). The European plan (Room Only – No Meals Included) will make you enjoy the best of the Resort, at your own pace and convenience, always with your own tastes and references. Enjoy your stay at Royal Resorts with the best services and amenities. All-Inclusive: Indulge in a worry-free vacation with all the benefits of one of the best options offered at The Royal Cancun: the All-Inclusive Plan. The exclusive All-Inclusive package is one of a kind because it gives you access to delicious dining, activities and lots of entertainment at The Royal Cancun and at sister resorts The Royal Sands® in Cancun and The Royal Haciendas® in Playa del Carmen, where more outstanding restaurants and other all-inclusive amenities await! Your all-inclusive vacation at The Royal Cancun® All Suites Resort covers accommodation, dining, beverages, activities, entertainment, kid’s club (4-12 years), gym, high speed Wi-Fi, access to the Fitness Center, taxes, tips and more. If you plan to go to the Riviera Maya, visit The Royal Haciendas and enjoy a seafood dinner at the prestigious Los Murales restaurant for the perfect culmination to a memorable day! Supervised Kids Club from 9 a.m. to 6 p.m. for children aged between 4 and 12 years old. Your kids will love the beach and the pools at The Royal Cancun® and there is quite a lot for them to do to have loads of fun! If you would like to spend a morning at the Spa, on the golf course or just relaxing, take them to the Kids Club where they will make new friends as they enjoy supervised games, crafts, sports and more (additional fee for certain crafts may apply). Please note that for guests’ stays crossing a Saturday night might need to change rooms. Should this be the case, The Royal Cancun will assist guests in order to make this an uneventful process. - Extra beds are not available. - Special requests are subject to availability and cannot be guaranteed. - At least one of the guests registered in each suite must be over 25 years old and will be held accountable for the rest of the suite's occupants. - Please note that a credit card or cash deposit will be requested upon check-in to cover any additional charges made during the stay. $500 USD per reservation. - Early departure policy: No refunds will be given for any cancellation or modification made after check-in. - Government-issued photo identification and a credit card or cash deposit are required at check-in for incidental charges. - For European Plan reservations, maid service is provided every day except on Sundays and legal Mexican holidays. - For All Inclusive reservations, daily maid service is provided. - Late Check-out Fee: $100 per hour. - Children 13 or older are considered adults. Standard adult fees apply. 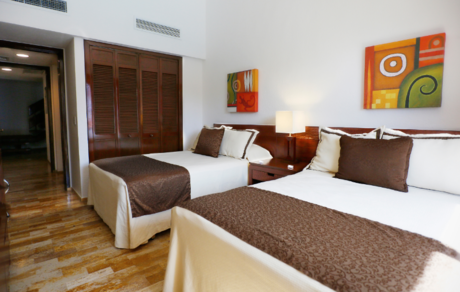 The Royal Cancun All Suites Resort is an amazing Cancun lodging choice for your trip to Mexico. With numerous amenities for guests such as room service, car rental, children's play area, you will wake up at The Royal Cancun All Suites Resort feeling excited every day for your time in Cancun. Don’t let this amazing reservation opportunity pass you by, book your stay at The Royal Cancun All Suites Resort today to make the most of your time in Cancun, Mexico. Ten minutes drive to Cancun's Hotel Zone.